Borriello is now a player of Genoa after signing for the grifoni, in what is assumed to be a co-ownership deal with Milan. Milan are yet to announce on their website that Borriello has left the Via Turati outfit, but with the fact that Borriello was one of the players unveiling the new shirts of Genoa we can all safely agree that he has joined the newly promoted team. 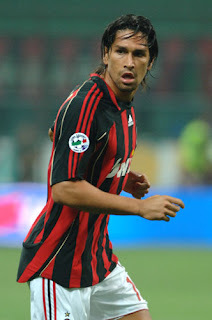 Borriello returned to Milan last season, after spells at Sampdoria and Treviso in the 2005-2006 campaign. He returned as a back up striker, as Milan had little time to find reasonable replacements for both the departed Shevchencko and Amoroso. The season was a difficult one for Borriello, as he battled to get into the starting line-up and like the rest of the Milan players, he battled to score. He did however, manage to net one goal for Milan and a vital goal too. It came against Cagliari where Milan were 2-1 down, and reduced to 10 men after Andrea Pirlo got sent off, the ball fell down and he cooly controlled it to do a kind-of bicycle kick to save Milan a much needed point. But the season got worse for Borriello, he was handed a 3 month ban for the use of drugs. It is said that the substance he took, was from an anti-infection cream that his girlfriend had. To save him a few blushes, I shall not reveal the rest of the story. Once Borriello's ban was released it was almost too late to make an impression on his Serie A campaign, but whenever given the opportunity to play he worked hard and always looked for that goal, unfortunately it didn't arrive. Now that he has joined Genoa, hopefully they will hand him some faith so he can go on to prove why he was one of the most highly rated youngsters. Good luck to Borriello, now it's time for Milan to find replacements for both Oliveira and Borriello. we only need 4 strikers so i think they'll only get one replacement. I half dont want to see Borriello back at Milan after the drug scandal.